There's a lot of angel imagery hanging around in out modern world. Angels on greeting cards, commercials, movies, and television shows. Some of them are really hokey and reaching for it, but some are actually pretty good depictions of them. There are some depictions that actually push the limits of what some consider as appropriate, Supernaturals rather uncaring Castiel for one. There's actually some pretty good reasons from departing from what most people see as angels being Micheal Langdon - like figures of cheap salvation. Let's be pretty clear: angels aren't exactly unique to the Christian faith. Christianity is based on Judaism and it also shares roots Islam. Angels have been mentioned in the Bible's Old Testament and the Hebrew Faith is pretty much based on the Old Testament, with the prophet Daniel having the honor of being the person who has the most dealings with them; although they were briefly mentioned in the stories of Jacob and Lot. Elohim is what the Jews called angels and they're actually what early Christians based their belief in angels on. Popular angels Gabriel, Raphael and Michael have their roots in Jewish literature. It's pretty safe to say that the early Christians, the core group of which were converted Jews, co-opted quite a bit of this imagery into their own beliefs. 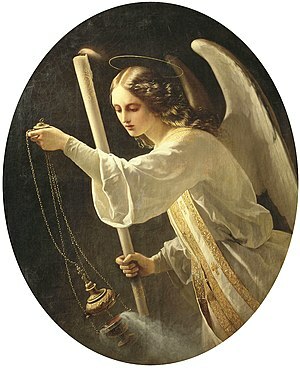 Christianity, the faith most associated with angels, has angels a-pleny. Some theologians believe that some were actually made up out of the blue to correspond with a particular idea or theme, but nonetheless, most Christians still believe in them. The New Testament pretty much has a whole army of them marching through - announcing Christ's birth to Mary, Joseph, and random shepherds, angels at Christ's tomb on his resurrection and various other tales where they helped apostles escape imprisonment. Christianity, with its large and early dominance, also has the honor of having a multitude of depictions of angels ranging from mosaics to stained-glass to sculpture. Even today's modern icons of angels are pretty much Christian-based - who can forget Micheal Langdon's classic Highway to Heaven and the more recent Touched by an Angel starring Roma Downey. Not to be outdone, Islam has its own share of angelic beings - they are a cousin faith to Christianity after all and actually have a surprising similarity in angelic beliefs. One of the six basic beliefs in Islam is the belief in angels or Malaekah, which pretty much means if you don't believe in them then your faith isn't exactly up to snuff. We can see also see the appearance of the popular trio of angels: Gabriel as Jibril, Michael as Mikaaiyl, and Raphael as Israfil. However, angels in Islam are viewed pretty differently - all angels have no free will and were created expressly to serve God. Zoroastrianism and the Bahá'í faith also share a belief in angels, although Zoroastrianism's belief probably developed around the same time as that of Judaism's. The ancient faith had a dozen angel-like figures who were representatives of Mazda, the Supreme God, though they were more like his limbs rather than his creations. Bahá'í is a fairly new religion and combines several belief systems into one, emphasizing that all faiths had a similar underlying component: the love of God. It's no wonder that it managed to gain angel figures - though these are people who have been totally embraced by God that they have overcome their human frailties and now are more spirit than human. As you can see, angels aren't just a Christian monopoly. They can be seen in all faiths and sizes. So you'll always be sure that an angel's got your back.